Mors Terrible controls, repetitive level design, bad camera... All these issues make Super Mario Prism a huge pain to play. I like that you're trying a 3D game for a change, but...Well, it very much feels like a first 3D title from a developer, I can say that much. 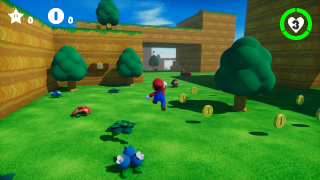 Mario feels slipperier than the marble from Marble Blast. And Mario's not a marble. Jumping on Goombas is way harder than it should be, let alone precise platforming. I recommend doing simpler 3D titles before trying to take on the Mario collect-a-thon. Even Annoying Orange Gaming had this on their channel! Obviously it's wonky and awkward but after having made 3d stuff myself I appreciate the effort put into this, nice work. I'm just like why is everything so slow? The acceleration, even Mario's idle animation speed lol. Though I do have to go along with Mattdraw and say that too: I appreciate the effort. *Just to let you know, I haven't tested the game myself yet, and I may still if I decide to, but so far reviews are making me decide otherwise. I downloaded the game cuz I thought it was good. Obviously, I was wrong. I wanted to write a review of it, but I couldn't finish the FIRST LEVEL (only collected 2 stars). Beautiful graphics doesn't hide a poor gameplay and level design.